ARE YOU feeling nervous? Of course you are, and you have every reason to feel a bit jittery because it’s that time of the year again: the Guild’s best van competition. As usual, the competition is open to all visitors to the trade show, regardless of trade affiliation. That’s right, dig under the driving seat for those banana skins, pull out the crisp packets from the ashtray and get all those door rope seals sorted out. 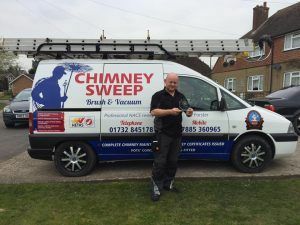 Because the van inspectors are coming to fix their beady eyes on your chimney sweeping vehicle and see if it scrubs up well. 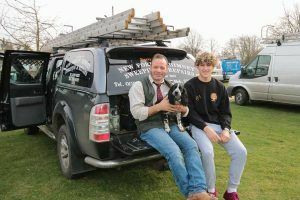 Judging for the best van competition will be held in a designated area in the hotel service car park at 2pm on Friday and at 1.15pm on the Saturday during the Guild of Master Chimney Sweeps Trade Exhibition 2019. The winner will be announced at 2pm on Saturday. To enter, just ask the Guild staff at the show entrance and they will get you to the right place in time for judging. An impressive £250 is offered as first prize and the runner-up is given £100. David O’Donnell from Essex was one of last year’s hopefuls. David said “It’s a great competition, we all love seeing in each others vans, learning how everyone else sets it out”. Last year David Barrott of Harrogate drove his pride and joy away with £250 in his pocket and Kevin O’Brien of Leicester was the runner-up. As last year’s winner, Dave Barrott has kindly agreed to assist with the judging. How do you know if your precious wagon is good enough to win the competition? You don’t – the judges won’t reveal what they’re looking for. 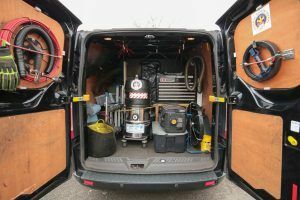 Even so, you can bet that common sense rules: a tidy, clean van inside and outside – a tool for every job, laid out in an orderly fashion and easily accessed. We heard a rumor that you can’t win without a BurnRight sticker on your van, surely that can’t be true? If you’d like to join in the fun and show off your van, make sure you enter the best van comp at the trade show! Watch highlights from last year’s show here!